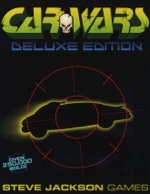 Car Wars Deluxe Edition made the 1983, 1985, and 1986 Games 100 lists as one of the best games of the year! Rulebook (144 pages), counters, maps, and turning keys. On the Highways of the Future, the Biggest Gun has the Right of Way! Car Wars is the game of combat on the freeways of the not-too-distant future. Choose your vehicle – complete with armor, power plant, suspension, even body style – then take it out on the road. You'll come home an "ace" or you'll crash and burn. If you survive, your abilities will improve, and you can accumulate money to buy bigger and better cars. Advanced rules let you design your own cars, cycles, three-wheelers, vans, trucks, 18-wheel tractor-trailer rigs, buses, boats, hovercraft, even helicopters! Car Wars – Deluxe Edition includes a 144-page rulebook, the Car Wars Compendium, for building, arming, and driving your own vehicles; full combat rules, including an introductory "quick start" version; and all the skills you need to create your own "autoduellist" character. Here are all the rules from the original Car Wars game and many of its supplements, edited and reorganized, plus sections on off-road travel, gas engines, jumping and falling, and more! Car Wars – Deluxe Edition also gives you hundreds of full-color counters, a giant 32" × 42" map of the fortress town of Midville, a 21" × 32" map of a fortified truck stop of 2048, a 21" × 32" map of the Double Drum Arena, improved road sections (straight and curved), and two "turning keys" that make maneuvering easy. Car Wars has been named to the "Ten Best Games of the Year" by Omni Magazine. It won the Origins Award for Best Science Fiction Game, and has several times made the Games Magazine "Games 100" list! Behold, the Deluxe Upgrade Package! Do you already own the Car Wars Compendium and just need everything else that comes with the Car Wars – Deluxe Edition set? Then this digital exclusive is for you! 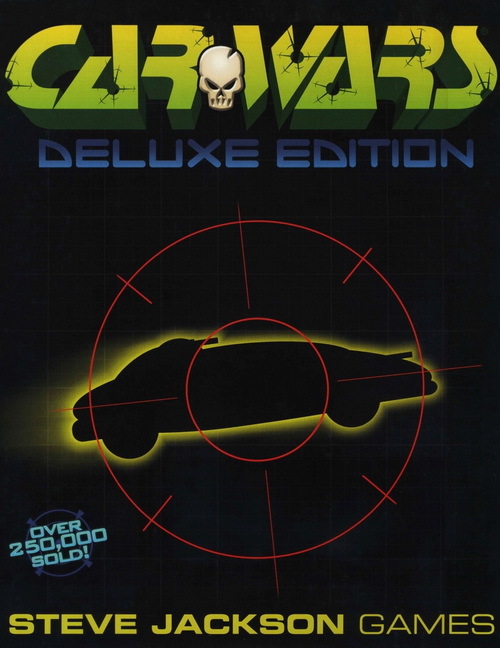 This version is identical to the full Car Wars – Deluxe Edition downloadable supplement, except it doesn't include the Car Wars Compendium rulebook. With that rulebook and these printable maps, counters, and jump-start rules and scenarios, you'll have the complete Deluxe experience!